Gambo Aerial Tram…this is a unique eco-tour taking you high above the ground on a 60 minute aerial excursion through the canopy of the rain forest allowing you to discover the beauty of the hanging gardens, animals and birds. There is an opportunity to visit the animal exhibits, including snakes, crocodiles, fish tanks and butterfly garden. 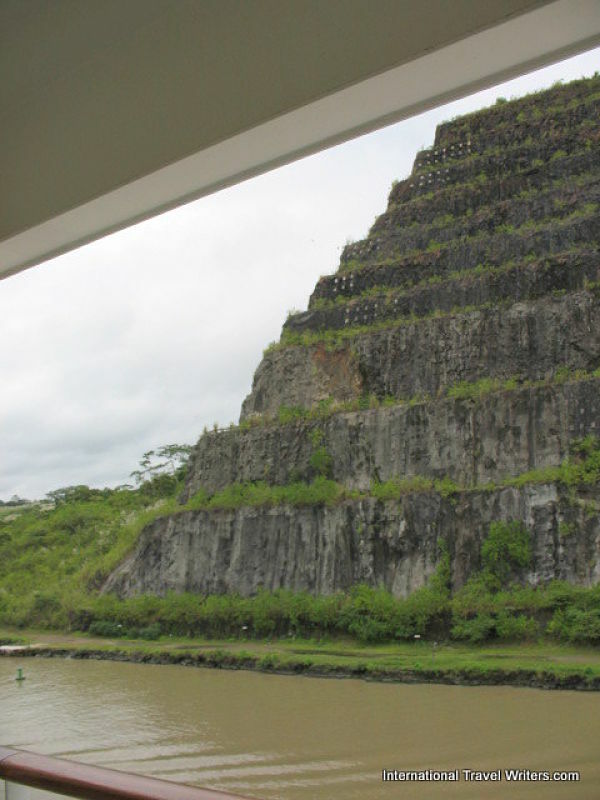 Gatun Lake Eco Cruise…The vast jungle area that is now the Gatun Lake area is full of wildlife. As this region was flooded, animals took refuge in the mountain peaks, which are now the many islands that dot the lake. 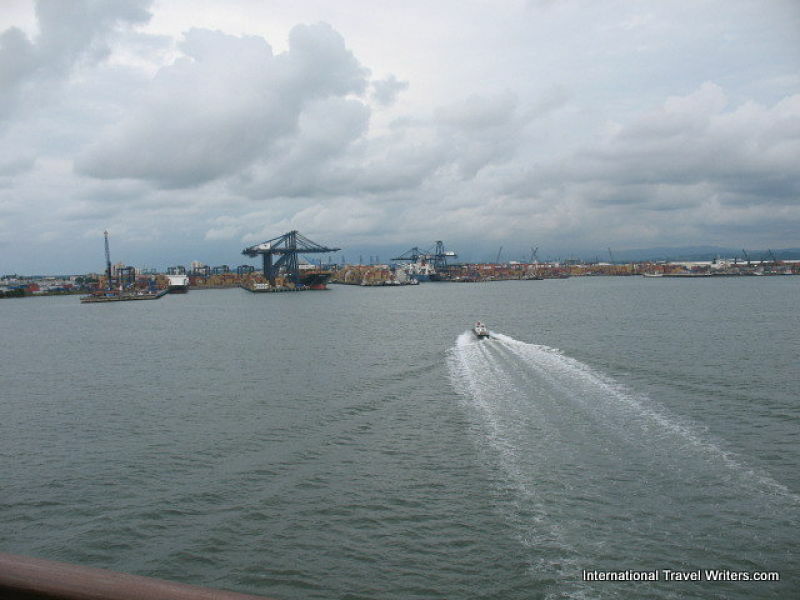 This tour cruises the back channels and bays that make up this unique ecosystem and you visit the Gatun Locks. 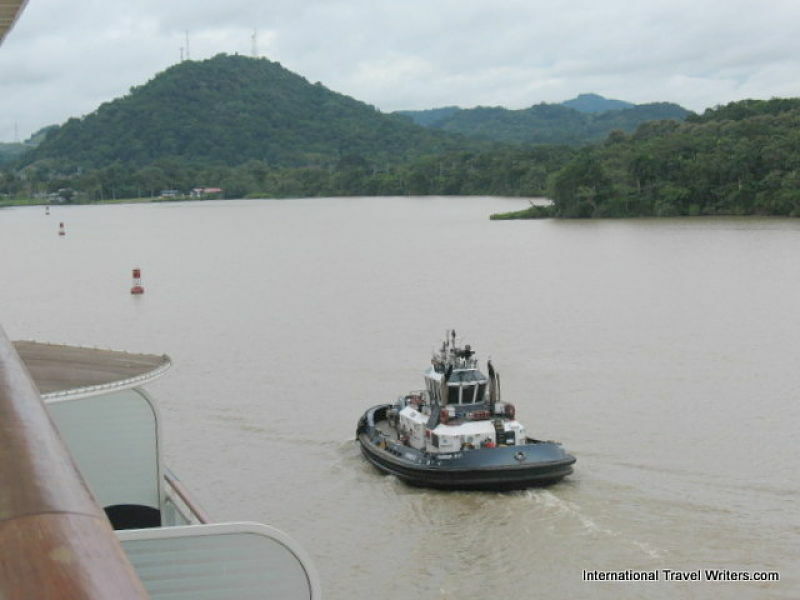 Monkey Watch…After a 30 minute high speed ride through the heart of the Panama Canal, the boat will slow down and enter the labyrinth of jungle-covered islands of Lake Gatun. The trained naturalist guides will track the wildlife as well as educate you about it and its habitat. There is a 1 ½ hour drive to and from this wildlife sanctuary. The Shaping of Panama…Visit the ruins of churches and convents, colonial palaces, bridges and military buildings that attest to the grandiose past of this city. During the excursion there will be time for a full buffet lunch at one of the leading restaurants on the Causeway before returning to your ship. Rainforest Nature and Wildlife Hike…A leading naturalist guide takes this tour for a short drive into the rainforest. The walk is not difficult and takes place on a dirt road that goes through the heart of San Lorenzo National Park for a view of some of the most diverse wildlife. 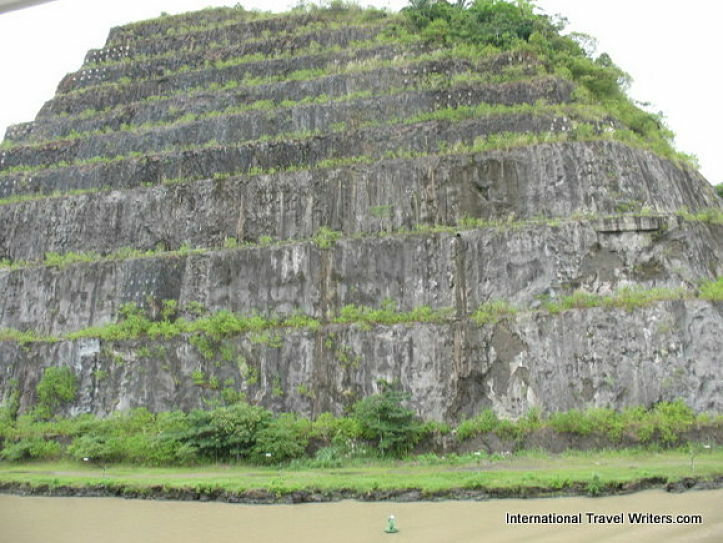 Portobelo & Gatun Locks…This tour to Portobelo gives a glimpse into the rich history of the area once known as the Paradise for Pirates. Enjoy the history and folklore with a visit to the Fort and its surroundings. 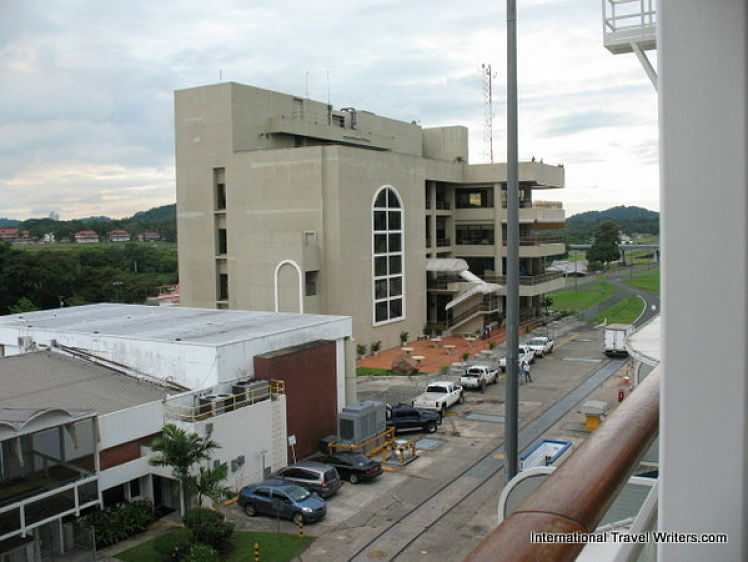 A guided tour to the Gatun Locks is included. Miraflores Locks & Observation CenterTake this opportunity to pause and view the ships that make their way through the Miraflores Locks’ chambers and visit exhibitions which include historical objects of the Panama Canal operations, interactive modules, video presentations, and models of the Panama Canal. For those of us that chose to remain aboard and continue cruising, we had ample time to take photos of the surrounding tropical scenes. Viewing from either our balcony or the Observation area at the bow of the ship, we were able to take a ton of photos. We discovered that the scenery onshore was green and lush. The map above that was on Caravan.com shows the process I describe below. The first leg was going through the two-step raising at Miraflores Locks and then a single raising at Pedro Miguel Locks.. 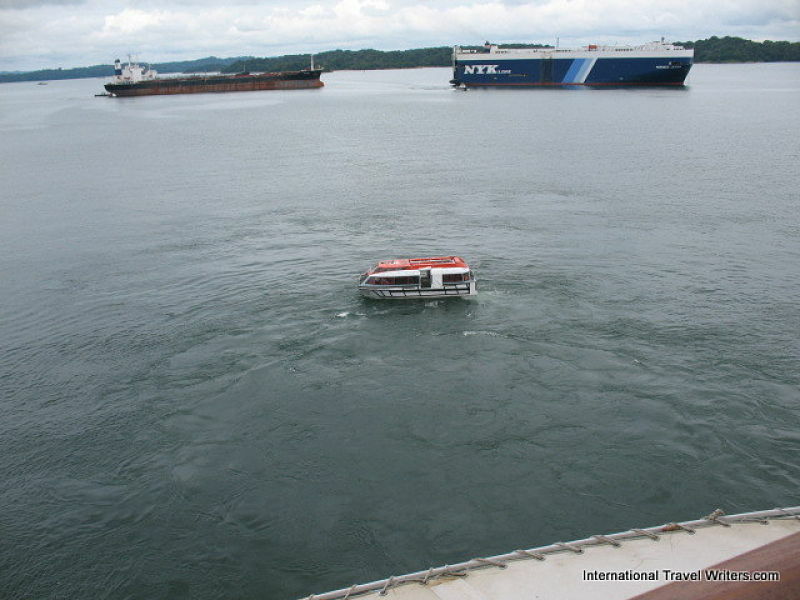 This process took the ship from the Pacific side up to Lake Gatun. There are actually 3 sets of locks which lift a ship up to the main elevation of the Panama Canal (85 feet) and the Gatun Locks have the 3 stages back down to the Atlantic. There are 3 steps up and 3 steps down. Although the length of the lock structures is only about two miles it takes considerable time for the passage. We spent a lot of time on the balcony (with a break to get lunch) and saw what looked like administration buildings on the shore. The canal narrowed in a couple of areas and appeared wider in others. 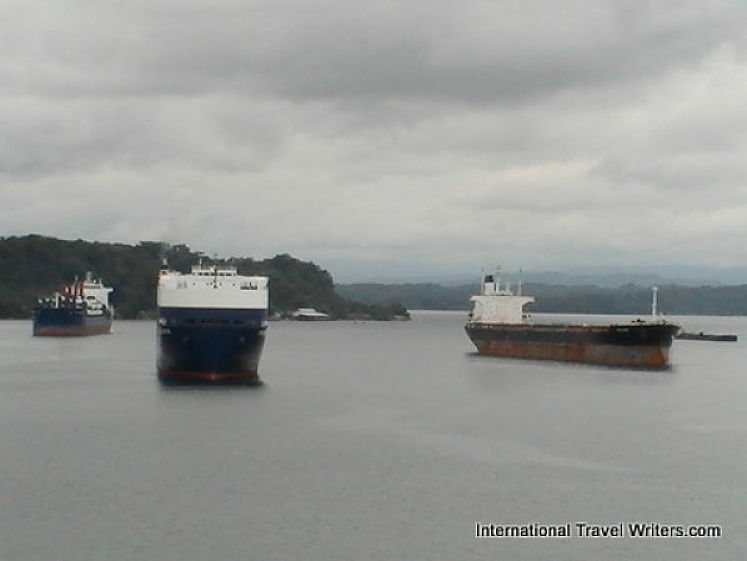 We saw the islands of Gatun Lake as a tugboat guided the ship into the area. We passed this stepped hill that looked like an old Mayan Pyramid to me, but no one could tell me what it was. I've tried to look it up but with no success. This is another angle of this pyramid shaped structure. I suppose it could be stepped planting but it looks so similar to other Mayan ruins we've encountered. The Centennial Bridge (Puente Centenario) is a major cable-stayed bridge that opened in 2004. 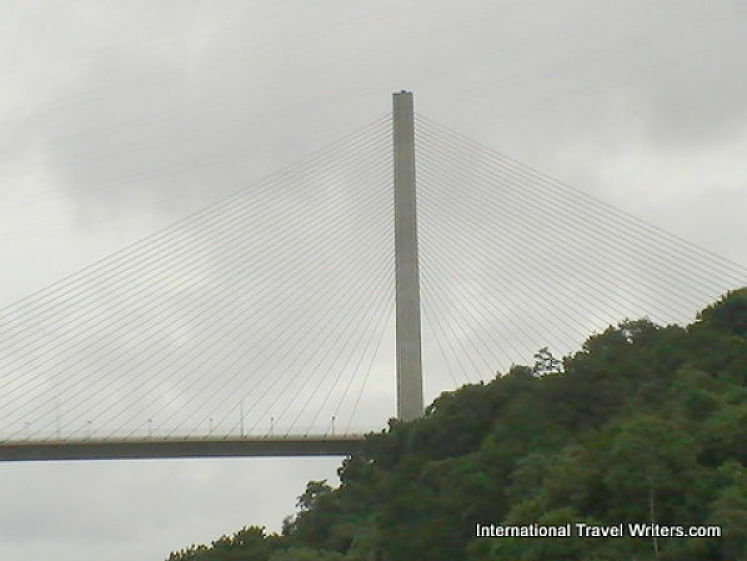 It crosses the Panama Canal and was constructed to relieve the traffic congestion on the only other bridge that crosses the Canal, Bridge of the Americas. There are a few smaller bridges (that carry limited traffic) built into the Lock structures but they are only usable when the gates are closed. As we neared the end of the passage through the Panama Canal we could see numerous cargo vessels that had been ahead of us that hadn’t been visible from our balcony. 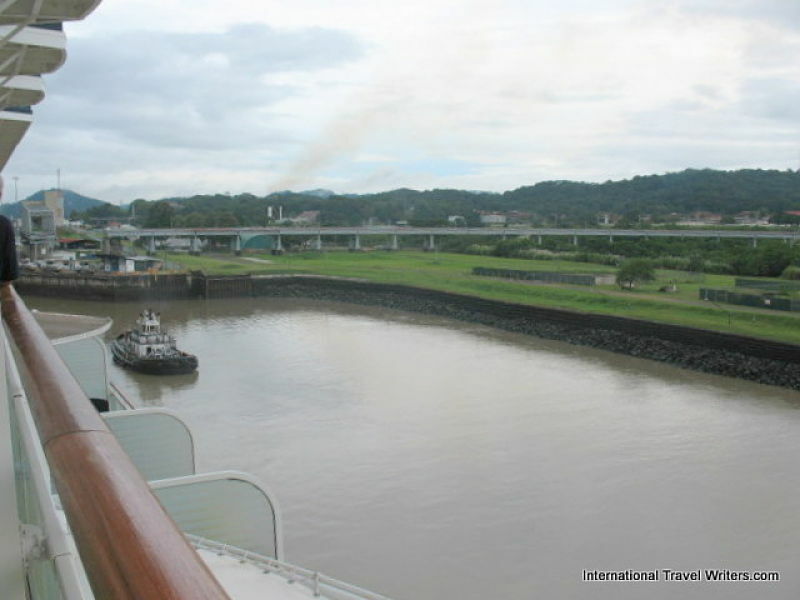 The Panama Canal has dual sets of locks making it a two way channel but the Gaillard Cut leading to Gatun Lake drops to one way whereby both lanes are used with large ships for safety reasons. 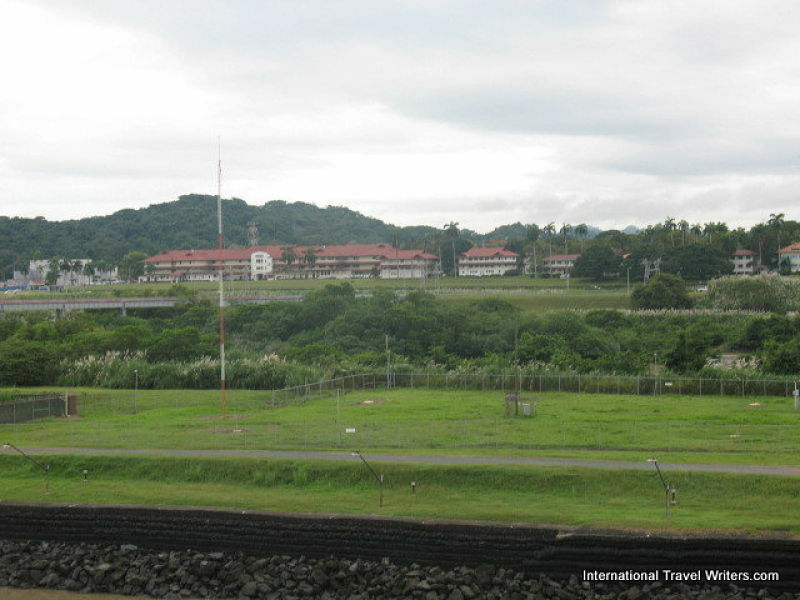 Once through that area, upon entering the Gatun Lake, there was two-way traffic again. The tenders started preparing to pick up the passengers in Colon that had taken tours. This was basically the last we would see of Panama. Once everyone was back aboard we would continue on to Cartagena, Colombia. We'd had a nice relaxing day sitting on the balcony with glasses of wine and taking photos. We knew we would have a full day in Cartagena because we had chosen a lengthy excursion.